NeuroCranial Restructuring & Nasal Specific In NYC. Would You Have A Different Life If You Had A Different Face? Forget Nasal Specific! Still One Of Hollywood’s Biggest Secrets, Neurocranial Restructuring® (NCR®) Will Change Your Life By Changing Your Face! Increase your height by as much as 2 inches over time! Enlarge cheekbones and reduce wrinkles without surgery! Your best complement to meditation, pilates and yoga! Align your spine - relieve kyphosis, lordosis and scoliosis! Reduce or eliminate headaches, migraines and vertigo! Relieve chronic sinus congestion and sinusitis! NCR® is a series of cranial adjustments applied over four consecutive days, with each adjustment taking approximately 45 minutes. Each 45 minute cranial adjustment begins with gentle bodywork to assess and unwind postural and structural asymmetries, while coaxing the body into a parasympathetic state of being. Then, extensive proprioceptive testing is conducted to determine your personal path of least resistance - to the most dramatic postural and structural shifts possible. 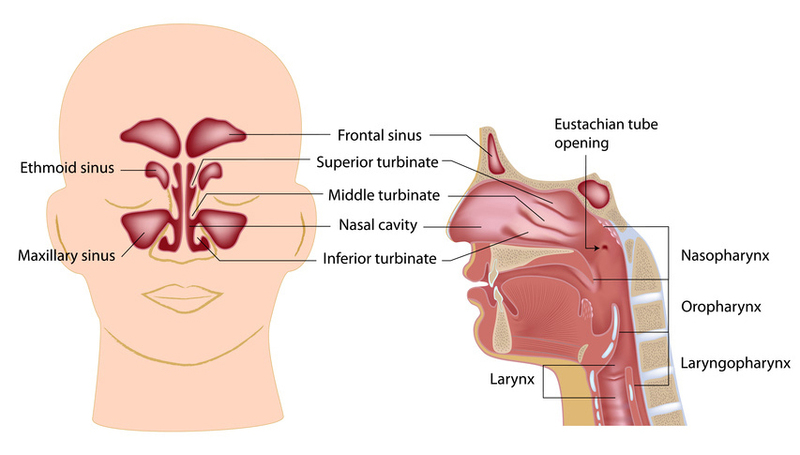 Next, a small balloon is inserted into one of your two nasal passages, and continues on into one of your six turbinates (all determined by prior proprioceptive testing). 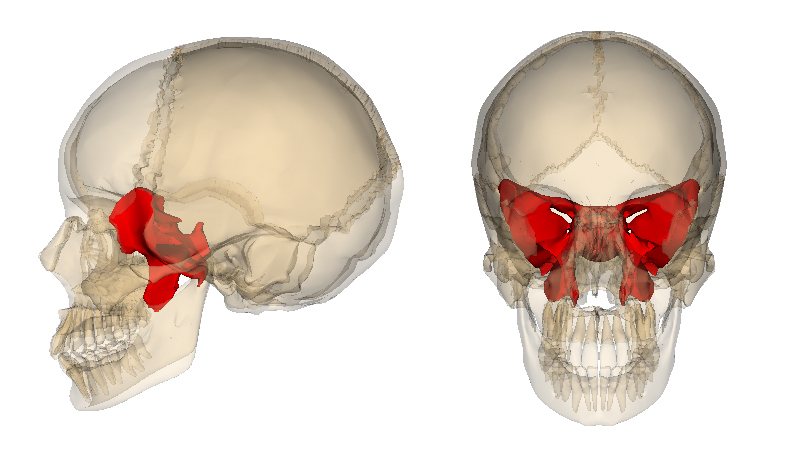 Finally, the balloon is briefly inflated and exerts a brief pressure against your sphenoid bone (see shaded section of bone in computer-generated cranial rendering below). This brief pressure (often described as similar to the feeling of getting water up your nose) causes the centrally located sphenoid bone to momentarily release its hold on the rest of the skull bones (similar to the waya spring releases a “jack-in-the-box”) and the bones permanently shift along the sutures into a more stable and symmetrical position than they found themselves in prior to your NCR® adjustment. Your new, more optimized skull facilitates lasting changes in your spine, nervous system, face, and nasal passages - and often quickly corrects a litany of health complaints that had at their foundation nothing other than suboptimal structure caused by the body's natural protective reactions to the physical, biochemical and emotional traumas that it had been subjected to over the course of your lifetime. The most obvious, common traumatic event that most people have experienced is what is called a “normal” vaginal birth. The intense squeezing of the head during birth - known as cranial molding, almost always leaves its mark on the adult skull. This affects both skeletal growth patterns and nervous system function for the life of the individual unless it is removed from the system via NCR®. Similarly… falls, beatings, sports injuries, motor vehicle accidents, surgeries, and biologically insensitive dental work all have a long-lasting impact on the nervous and musculoskeletal system. But I always thought that my skull was one solid piece of bone? The notion that the bones of the skull fuse together in early childhood originated out of a paper written in 1873, referred to as the “Munro-Kellie Doctrine” or the Kellie Munro hypothesis. Then, in 1929 Dr. William Sutherland’s studies and observation of the structure of the skull lead him to the theory that the bones of the skull moved slightly, which was a different take on the previously theorized and accepted idea that the cranial plates are fused together. It wasn’t until the mid-1970’s that John Upleger and his research team at Michigan State University employed the latest in technology using radio waves, electron microscopes, and cinematographic on recently deceased cadavers that they could prove that the bones of the cranium actually do move! Is NCR® really more effective than cosmetic surgery? NCR® is more effective than cosmetic surgery because NCR® can correct the asymmetries that are found in most faces whereas cosmetic surgery cannot. Eyes that appear to be different shapes, crooked mouths, uneven cheekbones, ears that don't line up… all of these asymmetries are always improved with NCR®. NCR® treatments also produce a totally natural facelift because they allow your cheekbones to rise and widen. These new, more prominent cheekbones smooth out wrinkles and erase the fine lines around your eyes due to the tightening of the skin over this new and expanded framework of facial bones. 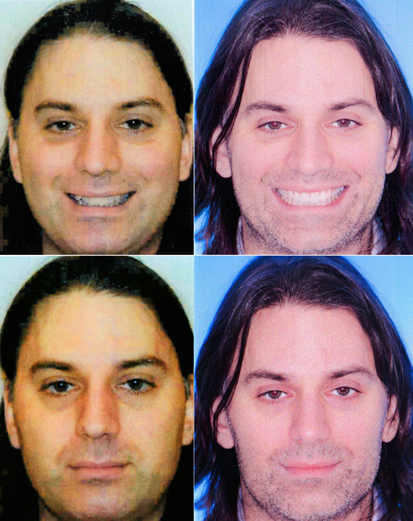 Finally, cosmetic surgery fails to improve “function and feeling” in a patient. Cosmetic surgery may make you look better, but it cannot make you feel better on a somatic level. It is for the above reasons that many famous Hollywood actors and actresses have anonymously turned to NCR® over the years to counteract the effects of aging while simultaneously making their faces more attractive to their audiences - by re-shaping them to resonate with the specific mathematical ratios and proportions that are scientifically proven to be the very definitions of beauty. How can Neurocranial Restructuring® resolve so many physical complaints? What people need to understand is that the #1 priority of your biological organism isn’t survival – its stability, and the most important aspect of your physical being that requires stabilization is your head. Remember, your head is basically a 12 lb. bowling ball teetering atop your cervical vertebrae! When your skull is subjected to trauma it changes shape, and the body consequently needs to change its shape in order to keep itself balanced so that you can remain upright. This is one of the main underlying causes ofspinal distortions such as kyphosis, lordosis, and scoliosis. Even if a chiropractor can reduce such curvatures, they can never fully work them out until the shape of the skull is corrected. What often happens in reality is that after a chiropractor sets the spine into a new position, the body will return back to the old position because that distorted position was actually the best position in order to maintain stability. Stability is more important to your organism than if you are in pain or have unattractive posture! In the case of headaches, migraines, tinnitus, vertigo, TMJ, depression, anxiety, OCD, chronic sinus congestion and sinusitis… once again we have a situation where a distorted skull can create all sorts of pressures in the head that are not supposed to be there – pressures that not only cause pain in the form of headaches and migraines or create an annoying ringing in the ears or give you the feeling that your nasal passages are permanently blocked, but pressures that exert themselves against areas of the brain which trigger compulsive behaviors or throw you into a low energy state. It is because of these dynamics, that an NCR® series can resolve so many physical complaints. How can NCR® complement my meditation, pilates and yoga practice? It can be theorized that the source of asymmetries universally found in all human faces and skulls is actually the human being resisting awareness to such a degree that the skull actually distorts itself in order to block access to the information spilling into awareness across the corpus callosum from the right side of the brain along with the mammalian and reptilian brainstem below. When one practices yoga and meditation to the degree that the kundalini awakens, it is common to suffer terribly as the energy attempts to push through these repressions made manifest in the skull and correct them. Many people become incapacitated for years as this biological process unfolds within them. Regular NCR sessions not only make sure that the path is clear for the kundalini energy to easily transform your being, but they also have the added advantage of giving one the opportunity to process psychic material that got buried at a comfortable pace, as the inflations remove the obstructions in the skull that held this material back for so many years. The more that can be processed in this manner, the less traumatic a kundalini awakening will be. Some NCR® practitioners can charge up to $1000 for a 4-day series. How is Neurocranial Restructuring® different from Nasal Specific? This practice of “Bilateral Nasal Specific” (BNS) was further developed by Dr. Richard Stober, a professor at Western States Chiropractic College and the National College of Naturopathic Medicine. The often painful and lengthy BNS sessions were eventually developed into the painless and brief NeuroCranial Restructuring® (NCR®) sessions thanks to the brilliant insights of Dr. Dean Howell who was Dr. Stober’s top student. The main difference between BNS and NCR® is that with BNS there is no way of knowing which turbinate to perform the balloon inflation in, so the inflation is performed in ALL of them. In BNS there is also no way of knowing how to position the body in such a way that the body will not fight against the inflation. In the beginning one often gets results with BNS, yet in subsequent sessions the inflations become harder and harder and require more and more force to achieve movement in the sphenoid bone. Using so much force in one turbinate after another typically throws the body of the client into shock which prevents progress from being made - since the body must be in a parasympathetic state for a session to be a success. Maximum results, minimum discomfort. That’s NCR®! I have had the NCR® procedure performed on me for many years, and finally in November of 2013 I got trained by Dr. Dean Howell at his home in San Diego in the latest NCR® protocols. The intent of this website is to document and share my personal journey of transformation that started with my first website (http://jawpain-tmjtreatment.com/) and will conclude with a third and final website in the future.